Over the years I have accomplished many things within my Art career. There was something that I always wanted to do but never got to, due to the obligations of life. This year I made it a goal and finally went for it. I entered a painting into the Topsfield Fair. The Fair has an Amateur and a Professional division and I entered the Professional division. I sat and thought about what would be a good subject, what would speak "County Fair" and my favorite things came to mind: Mason jars, apples and a basket. I worked on the painting during the summer. The color combinations made a pleasing palette of turquoise blue and bright green, with a nice deep dark brown of the basket. I set up the still life, moving the objects to find a composition that wasn't too "typical". I like the effect that a close up view gives so I zoomed in on the objects making sure there was plenty of light and shadows. Painting glass intrigues me. I love finding all the places that the light hits, bumping up the places where the colored glass is most vivid and creating the tiny reflections of other objects inside the glass. If you look close you will see a reflection of one of the apples on the back jar. I kept a careful eye out for the cast shadows that fell across the apples and the basket. I stayed away from getting too detailed with the basket allowing it to fade a bit making the the apples and glass the stars of this stage. I left all the fold marks and wrinkles on the the cloth they sat on and kept the background simple. The glass of the jars changed its appearance from the dark wall background to where they met the much lighter cloth on the table. The apples picked up reflected color of turquoise from the jars and a strange looking reflection on the top right apple from the piece of cloth that was tucked behind it. It was fun finding all these little details. There is a hint of a pattern on the dish cloth that the apples are sitting on, and a little string dangles off the edge, showing its age and wear. 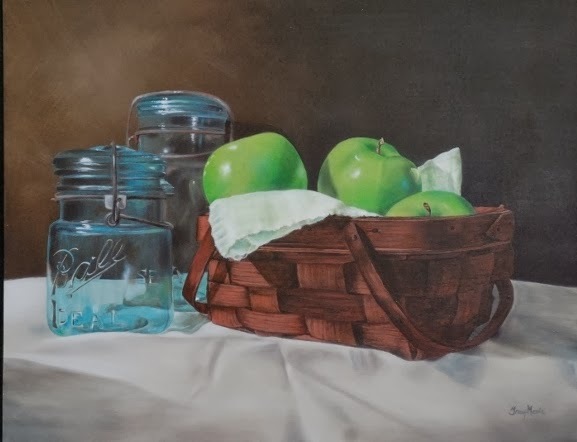 I totally enjoyed painting the still-life, was very happy with the way that the painting turned out and excited to see if it would bring a ribbon. I'm thrilled to report that it is hanging on the "winners wall" at the Fair! It took an Honorable Mention ribbon. I am very happy since it is the first time ever entering this type of competition and allowing myself to be judged and I won a ribbon. Now I'm looking forward to going and seeing it adorned with its ribbon and what the other paintings look like that it competed with. I achieved a long time goal and got over some fears of "being judged."